My favorite veggie: the Red Bell Pepper. I have determined that red peppers are one of my favorite vegetables. A wonderful combination of tangy taste and crunchy texture, bell peppers are the Christmas ornaments of the vegetable world. Not only are they great plain, but I love cooking with them too. They provide great flavor while sautéing meats or seafood. They are perfect with just about anything. They have pretty awesome health benefits too. The bell pepper is an excellent source of vitamin C. They have about twice the amount of vitamin C found in a typical orange! A bell pepper is also a good source of another antioxidant vitamin – vitamin E. Choose peppers that have deep vivid colors, tense skin, and that are free of soft spots, blemishes and darkened areas. Their stems should be green and fresh looking. Peppers should be heavy for their size and firm enough to withstand some pressure. 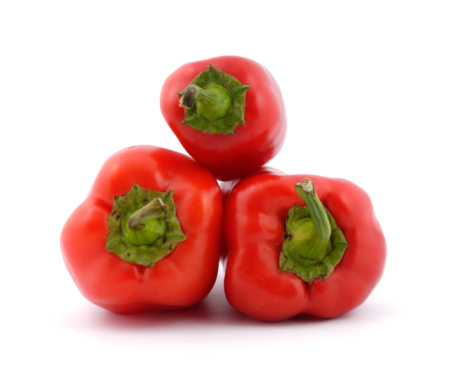 Next time you’re at the store, pick some red peppers up and experiment with them! Sauteed ShrimpThe Easiest Parmesan Crusted Chicken. I love them too. Had some for lunch!